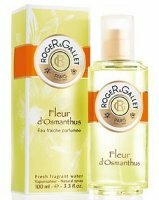 Roger & Gallet will launch Fleur d'Osmanthus in April. The new fragrance is based on Chinese osmanthus flower, "the true scent of happiness". The notes include mandarin, orange peel, grapefruit, neroli, osmanthus, tonka bean, sandalwood and benzoin. Ooh! Must try. That is exactly how I think of osmanthus–especially citrusy osmanthus–as the scent of happiness. I so agree. I have a sweet olive plant at home and it has such a heavenly fragrance when it blooms. I’m looking forward to trying this. I also love Osmanthus Yunnan, although it doesn’t really smell like osmanthus. Ooh! This sounds absolutely perfect for spring! Must try. I wish I had a local store that carried R&G, this really does sound nice. This does sound lovely, and with bath products to match – and a reasonable price as well! Can’t wait! Oh, just thought of the soap…must get this soap! If there is one, I may have to get it, too. R&G do such excellent soaps: dense, creamy, intensely scented. Their Sandalwood and Vetyver are mainstays, and Carnation is unimprovable. This sounds perfect for the upcoming season and they are releasing this at the perfect time. Imagine that! This sounds perfect for me. If only the nearest location it’s sold wasn’t all the way across the state ….. This does sound nice, and everything I have ever had from Roget & Gallet has been nice. Now if only they could bring back their Blue Carnation perfume (sigh!) It probably contained several ingredients now banned by IFRA. I live in Holland and over here the sell the Roger&Gallet products at what wel call : drogisterij (pharmacy) I am very curious about this one!! Let the spring begin.